The survey consists of four parts: (1) Judgment Survey; (2) Annual Projections, (3) Inflation Outlook of Enterprises, and (4) Number of New Graduates Hired. Part (1) and (2) are the most comprehensive ones. In the Judgment Survey firms are asked to characterize the respective conditions as favorable, not so favorable or unfavorable. The results are aggregated into a Diffusion Index (DI). The index is calculated by subtracting the percentage share of enterprises responding “unfavorable” from the share of those considering the conditions as “favorable”. In addition, in this part enterprises are asked to answer whether their interest rate on loans, output prices and input prices rose, remained unchanged or declined. 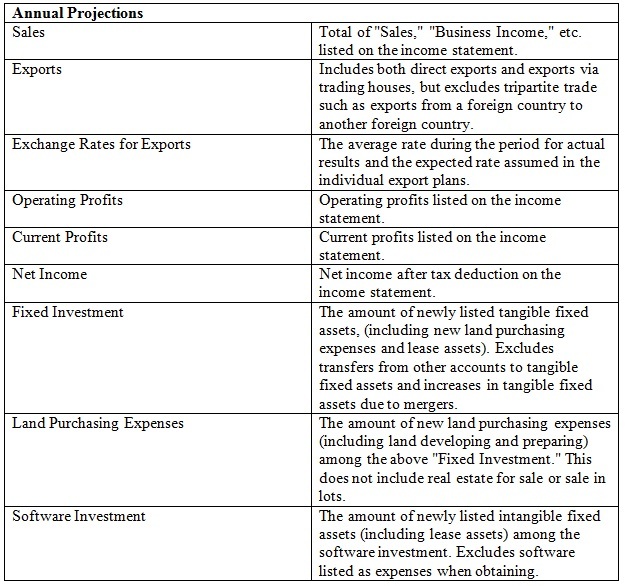 With respect to their Inflation Outlook enterprises are asked “to select the alternative nearest to their institution’s expectation of the fluctuations in the following prices for 1 year ahead, 3 years ahead, and 5 years ahead, as adjusted to exclude the effects of changes due to institutional factors such as the consumption tax. 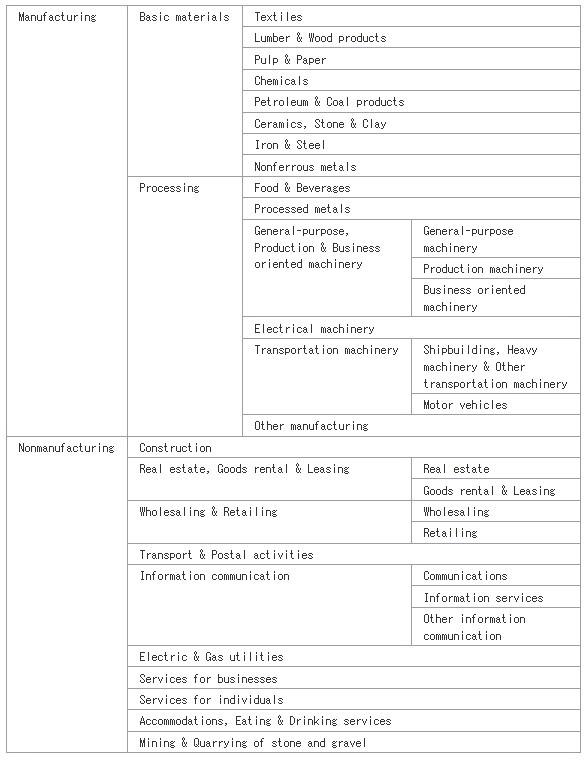 When a responding enterprise finds it difficult to narrow down its mainstay domestic products and services to a single product or service, the enterprise is expected to respond based on the weighted average expected price change for an appropriately selected subset of products and services. 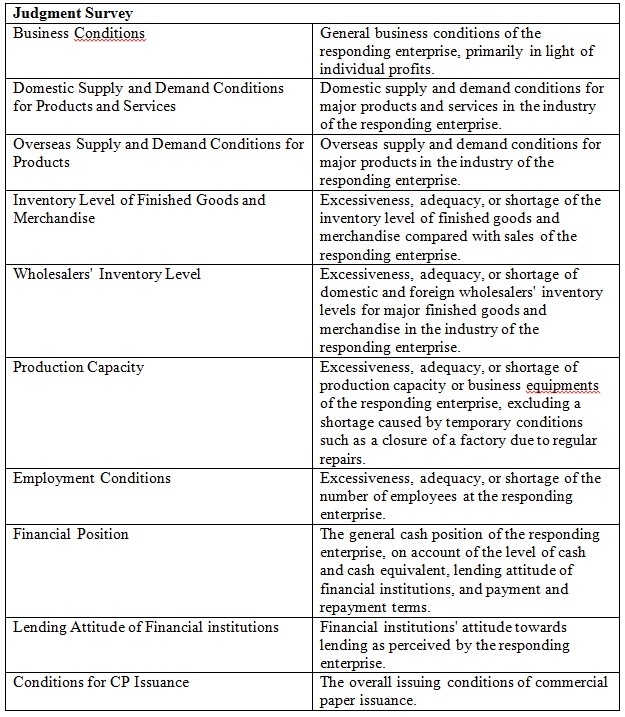 When a responding enterprise finds it difficult to narrow down its mainstay products and services to solely domestic ones, the response may include the expected price change for export-bound products and services, adjusted to exclude the effects of changes due to exchange rate fluctuations as much as possible. In addition, firms are asked to provide information about the Number of New Graduates Hired (surveyed only in June and December). This includes new graduates hired during the past fiscal year and the number planned to be hired during the current/next fiscal year. Source: BOJ: Tankan Summary (December 2014). Tankan results must be handled with caution for two reasons: In contrast to some interpretations the survey data do not reflect the state of the Japanese economy but individual judgments of what firms’ representatives think it is. A sentiment at best. The final survey results are even less than that as the Diffusion Index is computed as the difference between the results of two of three possible answers. The numbers only indicate a small or large discrepancy between these two, i.e. between those voting for “favorable” and those choosing “unfavorable”, and they neglect the third group of respondents who are regarding circumstances merely as “not so favorable”. Furthermore, as far as respondents are aware of the attention the survey results get from market participants, policy makers and observers in and outside the country they may be tempted to choose their answers strategically, not guided by their true assessment of circumstances but by their wishes and expectations of future market developments and policy changes. See for further information the BOJ Explanation of the Short-Term Economic Survey of Enterprises in Japan (Tankan).